Darren Wallace introduced our guest speaker Steve Barker. Steve is a Pome and joined the Royal Air Force at age 16 and spent 26 years in the service all over the world. 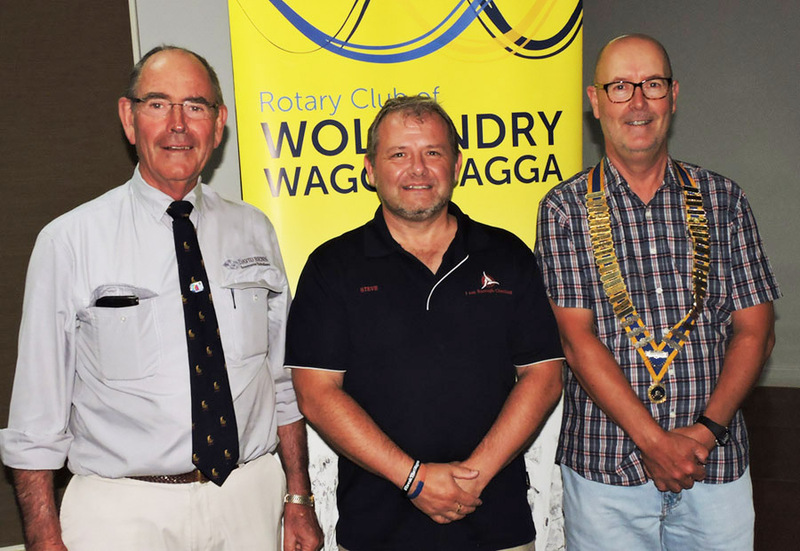 He moved to Wagga in 2013 on secondment and fell in love with the city. He resigned from the RAF and started his own personal training business … “I am Enough Coaching”. Steve thanked Wollundry for inviting him back as he had been at the club ten months ago. On his last visit he met Darren and Daniel who invited him to speak at RYPEN. Steve told a story about walking down a road and falling in a hole several times and eventually learning from the experience and learning to choose another road. He helps people to be the best version of themselves. He, then talked about RYPEN. He began his involvement working with young people who had previously attended RYPEN and were chosen to help as leaders for the upcoming RYPEN. He was impressed with the quality of the young people who had completed the weekend in 2016. Steve complimented Darren and Daniel for writing the exceptional leadership course. Moving on to the RYPEN in 2017 … Steve turned up not knowing what to expect. He talked about the common fear everyone has about how they would fit in or be perceived. Once, they realised that they were not alone … they could start relaxing and enjoying the weekend. RYPEN provided a safe environment … no bigotry... everyone accepted for themselves. After each speaker, there were breakout discussion groups reviewing the talks and everyone could express their opinion. At the end of RYPEN, there were tears and much sharing of Facebook pages,etc. He gave Rotarians credit for raising money to be able to support RYPEN and stop kids going down the rabbit hole. President Paul thanked Steve for his talk.